At the request of University of Massachusetts, Boston, JMS conducted a site survey of their Sea Mac oceanographic tow winch. The purpose of the survey was to assess the overall condition and obtain measurements in order to perform a structural analysis. The winch was designed and built by Sea Mac Marine Products, Inc. but manufacturer plans and documentation related to the structural capacity of the winch were not available. The winch is to be mounted on the deck of a research vessel and must comply with 46 CFR 189.35-9(c) which requires the winch to be able to withstand at least 1.5 times the calculated stresses resulting from application of a load equal to the nominal breaking strength of the wire or rope used. 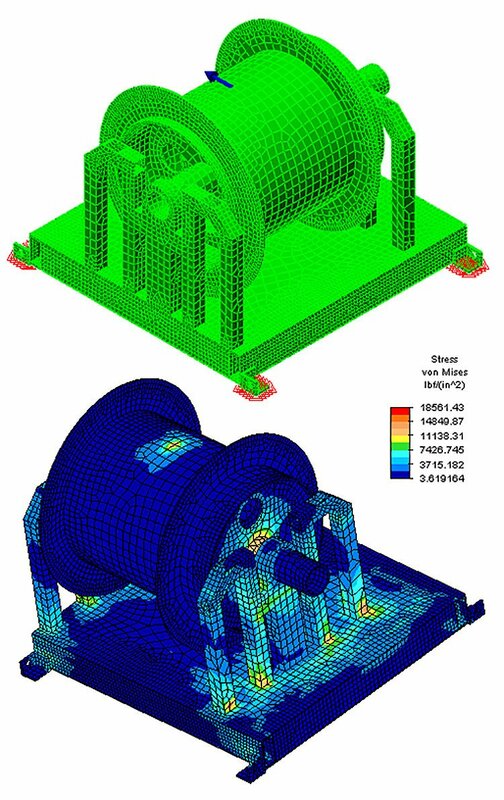 The entire winch was modeled in 3D, based on the survey measurements, and then transferred to Algor for the FEA analysis. A conservative approach was used for the analysis by placing the load at one point on the surface of the drum rather than distributing the force. Because the tow cable is wrapped around the winch drum in layers, the maximum load was increased to simulate the line pull acting on the top layer of the wire. Nine different load cases were analyzed to model the numerous positions and directions the tow cable would pull. The results of the analysis confirmed that the tow winch exceeded the structural requirements of 46 CFR 189.35-9(c).